1. Click on 'Reports' in the menu to open 'Reports Manager'. The categories of reports available will differ depending on the sport and the level of database access, e.g. 'teams' reports are not available at the team level. Click on the category of reporting you wish to use. 2. 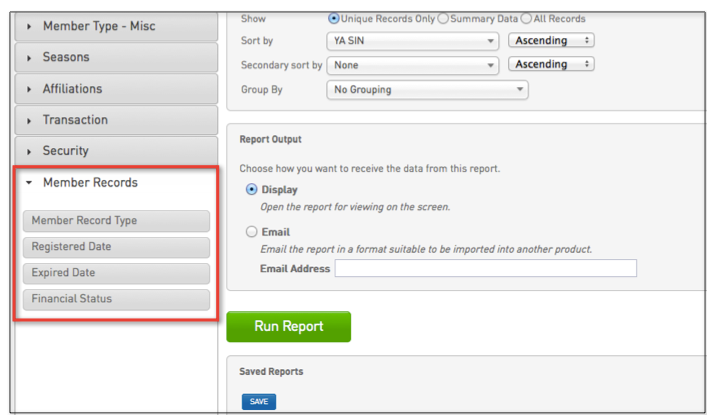 To run a report on Member Record Types, click 'Members', 'Advanced Member' - 'Configure'. 3. Drag across the fields from 'Personal Details' that you want to report on. Eg. First name, Family name, Date of Birth. 4. Scroll down to the heading 'Member Records' and drag across Member Record Type. 5. Once you have chosen your fields, scroll down and click 'Run Report'. Report Output: Report Output gives you the option to email the report as a text file, so it suitable to be imported and modified in another program. If you wish to use this option, you must enter a valid email address into the 'Email Address' field. Click here to see how to email reports as a text files. The final option available is to save the report. This will enable you to generate this same report again in the future at the click of a button, without having to go through the process of selecting and setting up all the fields and options again. Click here for instructions on saving reports and running saved reports. When you have finished setting all of the parameters for the report, click on Run Report. Your report will be generated according to the output method selected.